Friday evening was overwhelming. We packed most of the stuff that was left (which felt like every single thing we owned), had Chick-fil-a for dinner, and shed lots of tears. Saturday morning started early, with more packing. Josh got the moving truck, our wonderful friends came to help, and we packed up Josh’s car and then started loading the moving truck and my car. Seriously, our friends are the best. Thank you all for coming, bringing us breakfast, cleaning, making small trips to the house for us, and for doing SUCH heavy lifting. We were so blessed and felt so loved by your help. So thankful for our free room! Josh and I arranged some furniture after our friends left, and headed to take the Uhaul back around 4… or something like that. It was all a sore, exhausted blur to be honest. 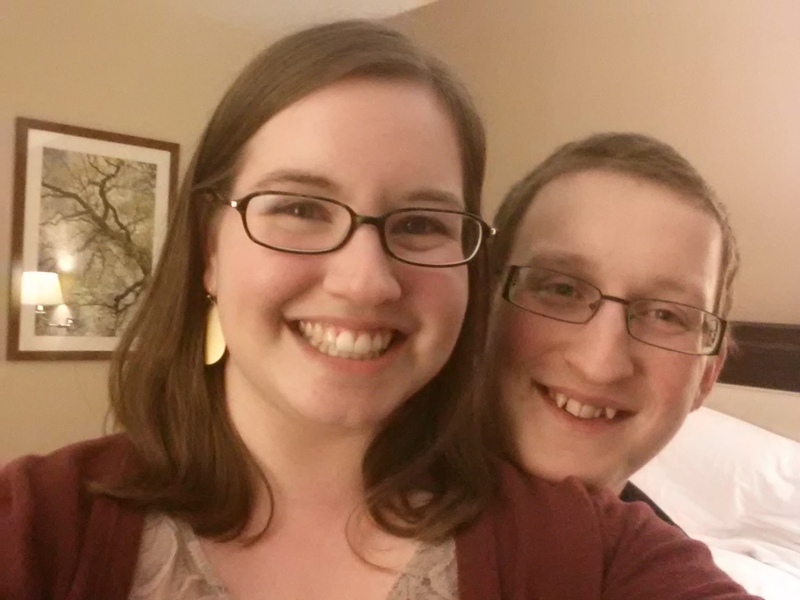 We got to the Sheraton downtown around 5:10, checked in and got up to our swanky complimentary room around 5:20. 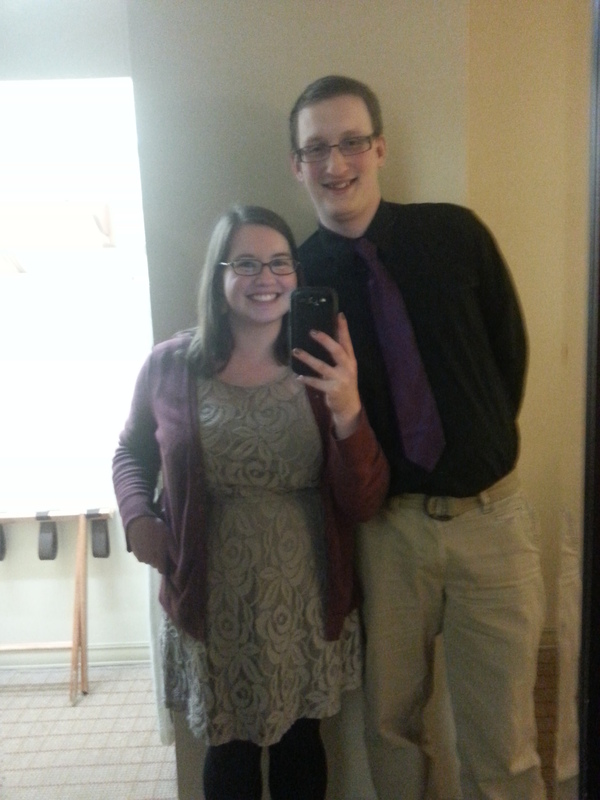 We took speedy showers, got dressed up, and we got to the Christmas party right at 6. We looked NICE too. Thus began a busy evening beginning with cocktail hour and mingling. As the evening unfolded, so did issues. I met the DJ and tried to find the lady in charge. When dinner didn’t start on time, and was 30 minutes late, I started asking the wait staff where she was AND THEY DID NOT KNOW WHO SHE WAS. When I finally found her and asked why dinner had not been served-and found out she decided not to follow our schedule… and had been “watching the crowd” and no one was eating their salads… to which I responded “No one announced it was time to begin! Well… it’s time to begin. Dinner’s already 45 minutes late and I have been looking for you.” Dinner was served within 10 minutes… and I’m pretty sure I was the first to be served. The rest of the evening was enjoyable. Josh and I sat with fellow Seminary students, and SO enjoyed their company. Josh and I won 2 giftcards to nice restaurants (free date nights! ), and when the “party” started we headed upstairs to our room. We caught “Santa Claus is Coming to Town” (classic)-and Josh said it was weird (poor confused man)- and were sound asleep by 11pm. Sunday morning, we slept in and went to breakfast before church. We went to a cute little place called Courtney’s. It was perfect. Old couples sitting with the paper and their coffee, young families with children cooing for more food, and couples like us. We both got breakfast platters- eggs, breakfast potatoes, blueberry pancakes for me and waffles for him, bacon for me and sausage for him. It was simply wonderful. After breakfast we headed to church. After church we went to our new home, and had a meal of sandwiches, chips & salsa. After that, we went to the apartment and worked on cleaning. That is, until I couldn’t stand anymore. See, here’s the thing: I really haven’t done much in 3 months between mono and being sick after that. This weekend knocked me out. So we called it and went back home to rest… which I’m not very good at. I sat down for maybe 30 minutes and then made the bed and started other stuff. After dinner I went back to the apartment to clean and Josh stayed at home to study for his Greek exam. I made MAJOR progress on the apartment- it’s all clean!- and Josh is picking up the rest of our stuff today. The main thing is that the move is done. And, in about an hour, the semester will be done as well. Then we get to have our 2nd married Christmas, settle into our home, and enjoy some much needed time together. I am so blessed to be your wife. Thank you for calming me down during all the freakouts, for being my social butterfly at the Christmas party, for taking me on spontaneous breakfast dates, and digging through boxes to help me find stuff. 🙂 I’m so proud of you for all the work you’ve put in this semester, and for taking care of me so well.